Prototype: 4 different Belgian State Railways (SNCB/NMBS) M2 series commuter cars. 1 type M2 A5B5 commuter car, 1st/2nd class. 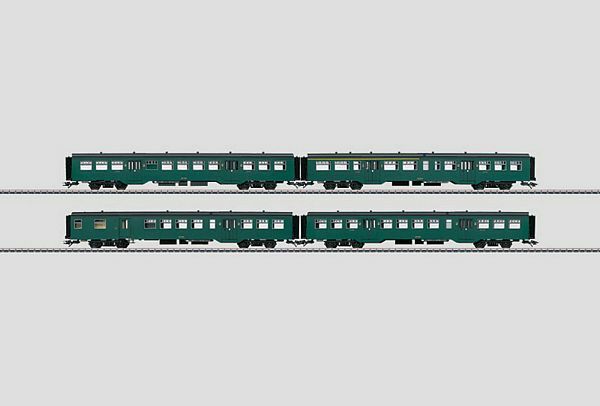 2 type M2 B11 commuter cars, 2nd class. 1 type M2 BD commuter car with a baggage area, 2nd class. Green basic paint scheme. Model: The cars have separately inset, graduated window frames. The 7319 current-conducting couplings or the 72020/72021 current-conducting close couplers can be installed on all of these cars as well as the 73150 interior lighting kit. The cars have different car numbers. All of the cars come individually packaged, with a master carton. Total length over the buffers 110.6 cm / 43-1/2". DC wheel set per car 4 x 700580. The diesel locomotive to go with this car set can be found in the Märklin H0 assortment under item number 39672.